On Saturday, April 21st, you have not one but two opportunities to celebrate and give back to our beautiful watershed! Join us at Albany Bulb for a shoreline cleanup, or head over to Wildcat Creek for a creek cleanup and the North Richmond Green Festival. Both events start at 9am, and will be a festival way to give back to the Bay! The Watershed Project is hosting its annual Shoreline Clean-up and Citizens for East Shore Parks is hosting a special event: Visualizing Sea Level Rise – bring your family and friends! Join hundreds of community volunteers for a morning of giving back to the Earth, while enjoying the beauty of the SF Bay. 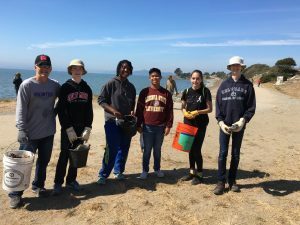 Learn about local efforts to protect our SF Bay watersheds and wildlife by reducing plastic in the ocean and creating resilient and living shorelines to protect our communities against sea level rise! Shoreline Clean-Up is from 9:00am to 11:00am. Everyone welcome to come clean up the beach and the bulb, enjoy snacks, and see our exhibits. We will have a prize awarded for the most unusual item found. Gloves and buckets provided, but please bring your own if possible to reduce disposable items. Wear sturdy shoes, a hat and sunscreen, and bring your own reusable water bottle if you have one. We request that dogs be kept on a leash on the beach and in the registration area. Visualizing Sea Level Rise is from 11:00am to 1:00pm. 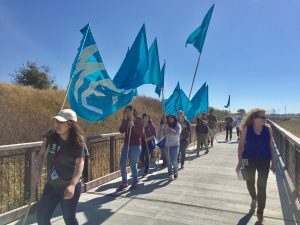 After cleaning the beach, come enjoy music, listen to speakers and join in the Visualizing Sea Level Rise March where volunteers can hold banners as they march which show the future sea level rise. Children must be accompanied by an adult. Minors under 18 require waiver signed by parent or legal guardian. Groups of 10 or more should pre-register, see contact information below for pre-registration or waivers. This event is co-hosted by The Watershed Project and Citizens for East Shore Parks in partnership with East Bay Regional Park District and the City of Albany. Please contact us at earthday@thewatershedproject.org with any questions or for waivers. Celebrate Earth Day by helping clean our urban creeks! 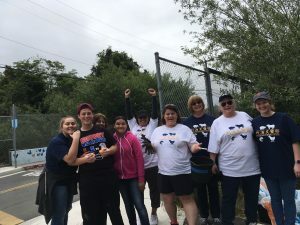 Join The Watershed Project at the North Richmond Green Festival, and help cleanup Wildcat Creek at Verde Elementary School. Learn about local efforts to protect our SF Bay watersheds and wildlife, and reduce plastic in our waterways! FREE refreshments will be provided as you work hard to clean up our environment! We will supply tools and gloves, but if you have your own pair of gloves and a bucket, please bring them to reduce our use of disposable items. Wear sturdy shoes, a hat and sunscreen, and bring your own reusable water bottle if you have one. This event is sponsored by The Watershed Project in partnership with the North Richmond Green Festival. Please contact us at earthday@thewatershedproject.org with any questions or to register. Thank you for coming out to show your love for the Earth! See you on Saturday, April 21st!